Today’s first was one of those little experiences that are just fun. 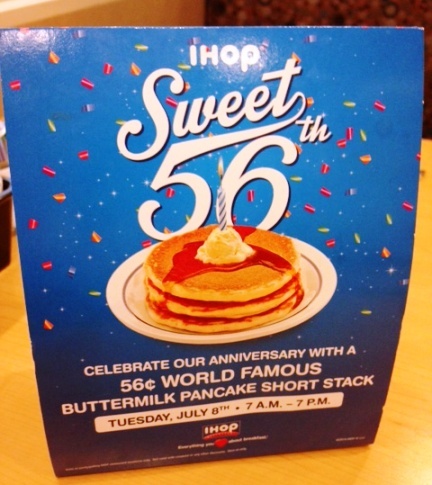 IHOP, otherwise known as International House of Pancakes, celebrated 56 years in business today. Restaurants offered their patrons a short stack of their famous buttermilk pancakes for 56 cents, from 7:00 am until 7:00 pm. Greg, Linda and I decided to have dinner at IHOP and join in the celebration. IHOP opened its first restaurant on July 7, 1958, in Los Angeles, CA. The original concept was to have a restaurant that featured breakfast items, such as pancakes, crepes, French toast and omelettes. They were famous for their different flavors of syrup. In the 1980’s the menu expanded to include lunch and dinner items. IHOP immediately adopted the franchise model and currently have more than 1600 restaurants across the US and recently opened franchises in Dubai and Kuwait. 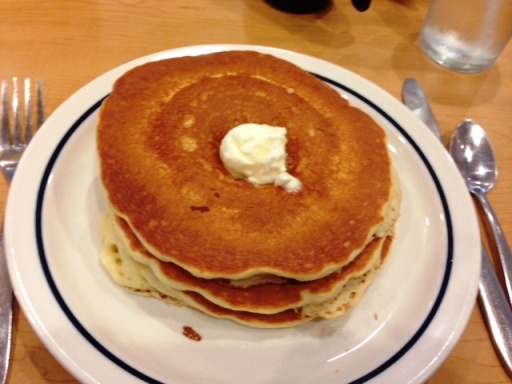 Consistently their top seller, IHOP has sold more than 700 million of their buttermilk pancakes. According to an IHOP spokesperson, there are three secrets to making a tasty pancake: water temperature of 50 degrees or less, lumpy batter and a hot 350 degree griddle The lumpy batter makes the pancakes rise, creating a fluffy, thicker pancake. I love having breakfast for dinner. We each ordered the 56 cent short stack and asked for a side of crispy bacon. Add in a glass of ice water, and we had a delicious and extremely inexpensive meal! 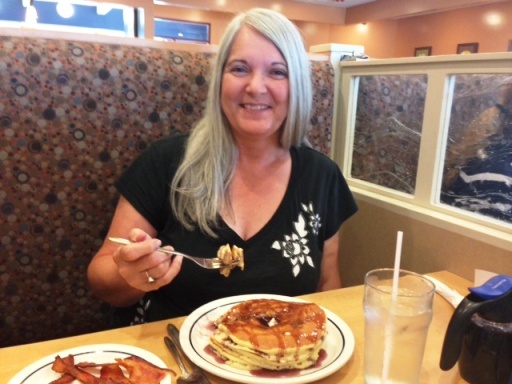 Linda and Greg requested warm maple syrup for their stacks but I opted for blueberry syrup. Our waiter, James, was friendly and fun. He said the Joplin store had had a very busy day. And indeed, everywhere we looked, groups of diners were enjoying short stacks of pancakes. We left James a generous tip, in spite of the low cost of our meals. Tomorrow I’m back to no sugar, however, tonight I enjoyed my fun dinner. Happy Birthday, IHOP! May you have many more birthdays, and many reasons to celebrate.